The new GDPR regulations taking effect in May 2018 can pose challenges for companies both in getting ready and remaining compliant post implementation. With that in mind there are some shiny new Sage CRM features to help! We’ve put together a summary of the new features from the Sage CRM 2018 R2 release below. Unfortunately here at itas we are not legal geniuses. We consider ourselves the wizards behind the technology! So we can’t advise you on how the changing regulations directly impact you. If you are seeking detailed guidance on GDPR visit the guide published by the Information Commissioners Office. You can also read through our previous blog for hints and tips on how GDPR may effect your business. Remember the basics! Don’t run away and hide! The focus for GDPR is on how businesses use and store personal data. Incorrect use of data can result in significant risks to business which can have severe consequences. A misconception of these consequences is that they can relate solely to fines. Some of our key responsibilities as businesses is to ensure that we understand how data is processed, who by and that when processing data it is not being misused or mishandled. We must also take steps to prevent data from risk of loss, damage, theft or corruption. The risks that can present themselves can largely be grouped into two categories. Risks that present themselves to the individual who the data relates to and the risks that exist to the business responsible for that data. Individuals who have been the subject of a data breach or issue may suffer damage or distress. The impact of a data breach can present financial, regulatory and/or reputational risks to organisations. 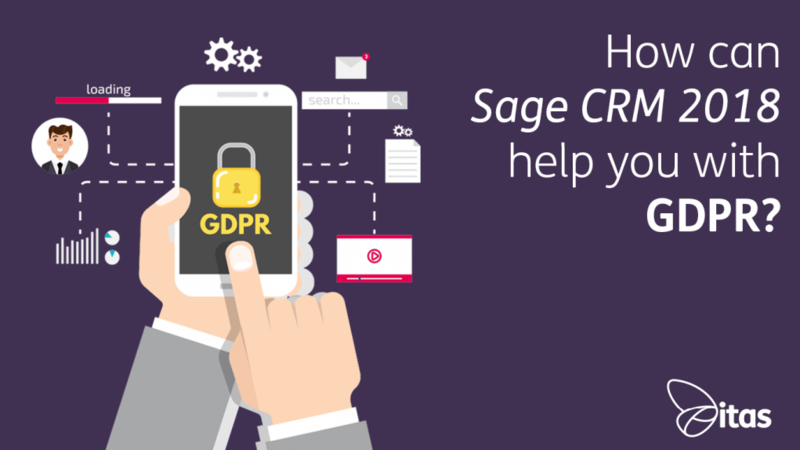 How can Sage CRM help me with GDPR? As a first step consider the below points for your business. Do you know how you capture, manage and track consents? Have you assessed what personal data you store in Sage CRM and is it necessary and relevant for your business? Have you reviewed your data retention policy? Could you be keeping data longer than necessary? The Sage CRM 2018 R2 release has new features designed to help manage consents and data. If you are not currently taking advantage of the benefits of Sage CRM take a look at our overview to see what solutions Sage CRM can offer your business. You can also always contact us to arrange a free demo to see exactly how Sage CRM could work for you. First up a simple consent tracking capability has been added. This allows you to store consents from customers against their contact record. With this new feature you can use CRM to create a central point for managing consents and provides an audit trail of consents for your business. Remember you will need to create records to capture the different types of consent given e.g. Marketing vs servicing. One consent does not fit all! If you need to update your current records you can also issue requests for consent manually or in groups using the template emails available in Sage CRM. You can configure the templates to include an ‘accept’ button/link that your contact clicks to indicate their acceptance. This can then be automatically captured on the consent record. Sage CRM doing the hard work for you! Greater ability to anonymise and delete data. How we store and retain personal data is a key component of GDPR and its important to review your policy to ensure it complies. Its always a good idea to take a moment to consider what data you record and perform any clean ups required. It can often carry the added perk of freeing up space on your server! While you will probably want to keep records to retain history of sales or opportunities you may need to consider anonymising the data. Similarly you may identify records that you no longer need and want to remove a high volume of records but want to avoid manually processing the records one by one. The mass anonymisation of fields in a group of records is already possible in Sage CRM but hurrah it’s now also possible to mass delete certain records. In Sage CRM 2018 R2 you will see new Mass Update and Mass Delete buttons appearing which will allow you to complete. You will need to ensure that you have first allowed mass operations to be performed. We can always help with this if needed. When deleting records we always recommend anonymising any personal data first. Sage CRM processes ‘soft deletes’ so a history of the record will appear in the database behind CRM. In the Sage CRM 2018 R2 release a brand new feature for deleting communications and documents has been introduced. You can remove all communications that you have recorded associated to a person in your CRM. You can also remove any documents stored that are associated to that person but only if they are the sole person connected to the document. Please note only those with an administrator role in your CRM will be able to use these features. Hopefully you have found this guide useful. Feel free to post any questions you have about the new features in Sage CRM 2018. Please contact us for support using and customizing Sage CRM. If you are interested to take advantage of new features give us a call to discuss upgrading. Home » Sage Blog » All Sage Blog Posts » How can Sage CRM 2018 help you with GDPR?